This is a new tour that covers both the Amalfi Coast and Classic Tuscany. There will be 3 days in the Amalfi Coast area, 1 day to reach Tuscany, and 3 more days in Tuscany around Siena. Two areas of great natural beauty steeped in history and culture. If you just have 7 days riding in Italy this would be at the top of the list. Day 2: We head down to Pompei along the Ancient Appian way and visit this amazing archaeological site with an English speaking guide so that you will get the most out of your visit. After lunch we ride the first part of the Amalfi Coast and reach Amalfi where we will stay two nights. We will be staying right in the heart of Amalfi's historical town with a great hotel so that you'll be able to walk around this amazing town and soak up evening life in the Amalfi Coast. 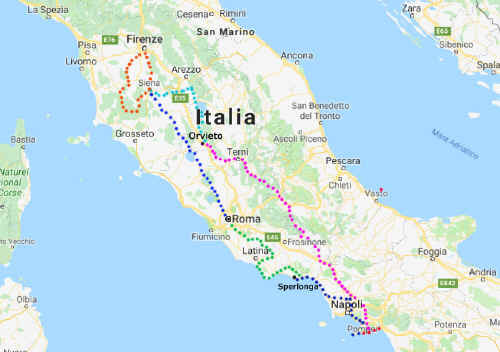 Day 3: You have a full day in the Amalfi Coast to admire this unique coastline, visit places like Ravello, Cetara and Vietri sul Mare, and ride to the tip of the coast and back to Amalfi. in the evening we shall be taken by boat to a very exclusive restaurant only reachable from the sea. Day 4: we head back north with destination Orvieto as our mid-point between the Amalfi Coast and Tuscany. We must travel for about an hour on the Autostrada, but in Cassino we will leave the highway and, after a visit to the monastery of Montecassino, we shall take the side express roads which will give you a glimpse of the mountains of Abruzzo and Umbria. Orvieto is an amazing town perched on a tufa stone plateau. It has one of the most interesting cathedrals and our hotel will be overlooking it. 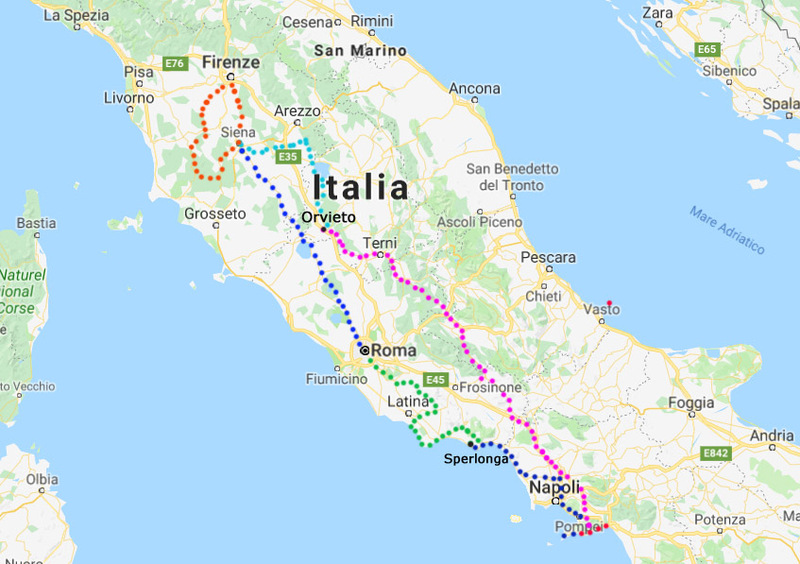 Day 5: From Orvieto we ride along the Tiber Valley and view Lake Trasimeno, visit Cortona and then reach Siena along the enchanting hills of the Crete Senesi. We stay two nights in Siena. Siena is our favorite town in Tuscany. It's very lively and is surrounded by gorgeous landscapes and roads. Day 6: You could easily spend the day in Siena and visits the sites and do some shopping, but you could also do an amazing Classic Tuscan loop ride. We cover the wine region of Chianti with its hills and vineyards, quaint villages and amazing twisty roads. The road surface is perfect and the scenery always breathtaking in any direction. At the end of this amazing ride we'll be back in Siena for another evening of strolling around the main square, enjoying a few glasses of red and not looking forward to the end of the tour. Day 7: our last day of the tour and we head south back to Rome. We'll mainly be along the Via Cassia SS2, but with some interesting diversions to view some more Classic Tuscany. 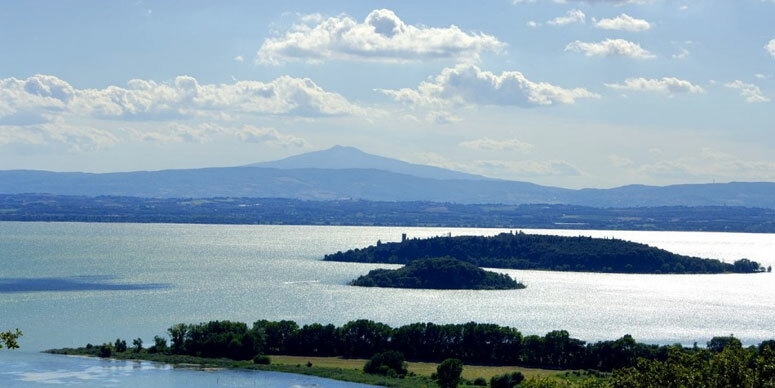 Once we enter Lazio we will be greeted by Lake Bolsena, the greatest volcanic lake in Italy, and from there it will be just a couple of hours into Rome. It will be Saturday, so an easy ride to our hotel and a great farewell dinner.